Last week, at its 5th scheduled meeting of the year, the Federal Open Market Committee voted to leave the Fed Funds Rate in its target range near zero percent. The Fed Funds Rate has been near zero percent since December 2008 and, in its official statement, the FOMC pledged to leave the Fed Funds Rate untouched for at least another 2 years. This doesn’t mean mortgage rates will be untouched for 2 years, though. Mortgage rates and the Fed Funds Rate are two different interest rates; completely disconnected. If mortgage rates and the Fed Funds Rate moved in tandem, the chart at right would be a straight line. To make the point more strongly, let’s use real-life examples from the past decade. Today, the separation between the two benchmark rates is 407 basis points. 1 basis point is equal to 0.01%. Between now and mid-2013, when the Fed may begin changing the Fed Funds Rate, the spread between rates will change based on economic expectation — not Fed action (or non-action). If the economy is expected to improve, mortgage rates in Port Aransas will rise and the spread will widen. Should mortgage rates cross 6 percent before the Fed starts raising rates, it will create the widest interest rate spread in history, surpassing the 615 basis point difference set in August 1982. At the time, the Fed Funds Rate was 10.12% and mortgage rates averaged 16.27%. On the other hand, if the economy shows signs of a slowdown for late-2011 and beyond, mortgage rates are expected to drop. Shopping for a mortgage can be tough — especially in a volatile environment like the current one. 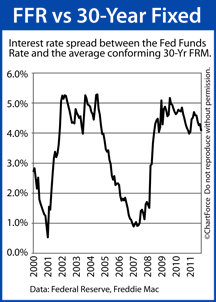 Mortgage rates move independent of the Fed Funds Rate. Make sure you’re watching the proper market indicators. It’s your best chance to lock the lowest rate possible. « What Perks Does Your Favorite Credit Card Offer?